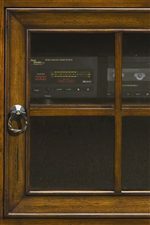 This traditional entertainment chest has a flip down drawer with AC outlets to store VCR, DVD player or other electronic components. Interchangeable wood panels and glass panels are available for the drop front drawer. Place your TV on top and fill with your favorite electronics to complete this amazing television console. Three additional storage drawers with faux fronts provide storage area for clothing or other media equipment. 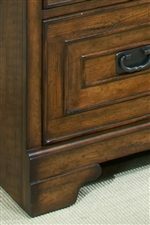 Oak veneers with a rich medium Chestnut finish and antiqued metal hardware ensure that this TV chest will complement your home. The Centennial Entertainment Chest with Drop Front Component Storage Drawer and AC Outlets by Aspenhome at AHFA in the area. Product availability may vary. Contact us for the most current availability on this product. 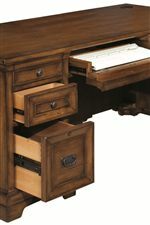 The Centennial collection is a great option if you are looking for Traditional furniture in the area. Browse other items in the Centennial collection from AHFA in the area.